Ayurveda is one of the earliest codified knowledge of health and healthcare. Dr. Sanjeev Rastogi and his colleagues have addressed the importance of evidence in this book in a comprehensive manner. Dr. Sanjeev Rastogi working as Associate Professor, PG Department of Kaya Chikitsa, Lucknow University, has made a herculean effort to amalgamate the traditional thought processes with contemporary approach of evidence base practice. Other co-editor Prof Fransesco Choappeli, an apt icon in the field of evidence based medicine, dentistry and complementary medicines has touched upon the silent fundamental elements of the evidence based process in complementary and alternative medicine. Prof RH Singh a legendary Vaidya Scientist in contemporary sense and an eminent emeritus Professor from Banaras Hindu University has highlighted the need of documentation of existing evidences, designing diagnostic and clinical parameters which can act as evidence to help a decision making and demonstrated the safety and efficacy of complementary medicine like Ayurveda. Dr. Manish Harish Ramchandani with her efficient content editing has efficiently and logically put forth the rationality behind the traditional medicine. The authors emphasize that EBM is quite achievable in context of traditional medicine, without compromising its fundamentals. This book brings together the collective knowledge and insights of leading experts from Vaidya community. It highlights the scientific pursuit and concept of evidence based practice ingrained in Ayurvedic wisdom and holistic approach toward prevention, promotive and palliative healthcare concepts in complementary and traditional science like Ayurveda, Yoga etc. It covers important topics like evidence based clinical practice, diet and nutrition, clinical evidence in the traditional classical texts and other contemporary research initiatives undertaken to rationalize the traditional concepts through various scientific studies. The unique effort to study concept of prakriti (constitution) in perspective of genomics and review of the literature on panchakarma therapies are exemplary. The conceptual and empirical proofs based on pre clinical and clinical data on effect of traditional diet, medicine and lifestyle in the arena of cardio-vascular disease, rasayana or geriatrics and oral disease give us an insight into inclusive, integrative and holistic approach to these health issues. A very unbiased and dedicated effort is also made to discuss safety issues of Ayurvedic drugs in the purview of EBA and eagerness to strengthen the pharmacovigilance system for Ayurvedic products to find out the rare side effects. This work is categorically, a dedicated effort of innumerable scientist and Vaidya scientist with scientific zeal to bring an equitable, affordable, sustainable and dependable form of health care with due respect to the traditional wisdom of health care. The book comprises of four basic sections including thirteen chapters. Contents with authors of each chapter are mentioned as below. Evidence based Traditional Persian medicine: Mahsa Dousti, manisha Harish Ramchandani, Andre Barkhordarian Sohrab Danaei and Francesco Chiappelli. 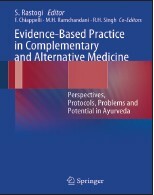 Toward Evidence - Based practice of Ayurveda: Extrapolating the challenges in the current Decade: Sanjeev Rastogi. The book portrays a pathway towards accomplishing the effort of promoting evidence based practice in complimentary medicine by undergoing the rigors scientific evaluation, measuring effectiveness and safety.